Sochiro Honda named his first serious motorcycle model the "Dream." The late founder's passion was a powerful and economical power source, the engine that made many corporate dreams come true. Honda Motor Co. recently adopted the corporate slogan "The Power of Dreams," President Hiroyuki Yoshino declaring, "We are Honda Motor Company, and by 'Motor' we mean motive sources, including internal-combustion engines and electric motors." Honda's near-term goal is to attain 15-million-per-year unit sales, not in terms of vehicles, but in the number of products powered by various power sources, be it on two, four, or no wheels (several on two feetthe Asimo humanoid robot will be offered for rental in 2002). The goal is within the corporation's reach; in 2002, the company plans to produce 14.5 million units, comprising automobile, motorcycle, personal watercraft, and power equipment products. True to the corporate slogan, new powertrains are accelerating various products. Most significant in the automotive applications are the latest "i-series" inline four-cylinder engines that power several new Honda vehicles. The small letter "i" stands for intelligent, a favorite "in" identification of the Japanese OEMs; however, in Honda's case, it is true to its meaning. The new-generation i-series makes a marked departure from the company's establishednot necessarily by choicetradition in that the engine revolves clockwise. All previous Honda I4s turn counterclockwise (except the high-output S2000 sports car unit, but that is a small volume unit and longitudinally mounted), the legacy of the company's first serious passenger car model, the diminutive Life sedan of the early '70s. The tiny car accommodated four adults, albeit of Asian stature, in acceptable comfort. 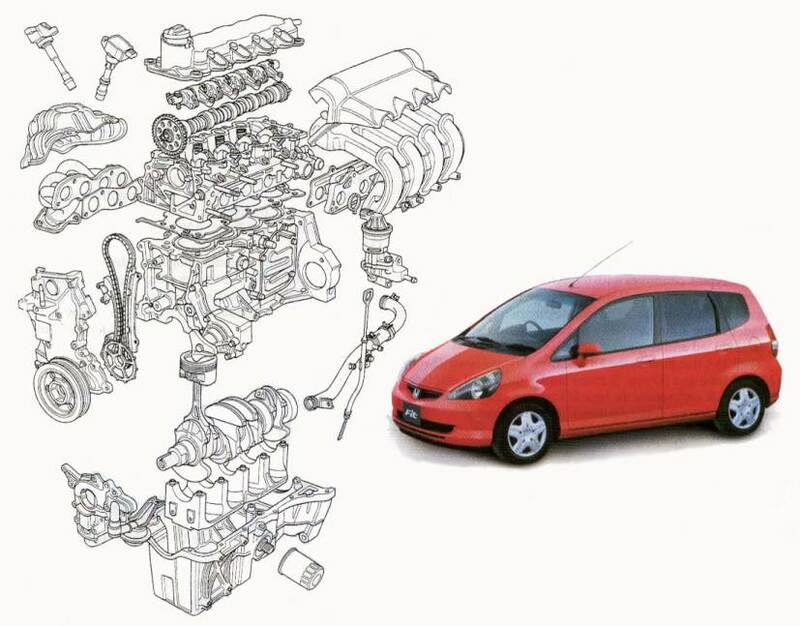 The volume of mechanical parts of the car was reduced to a minimum while maximizing people space according to Honda's new "MM" (Man Maximum, Mechanical Minimum) philosophy. 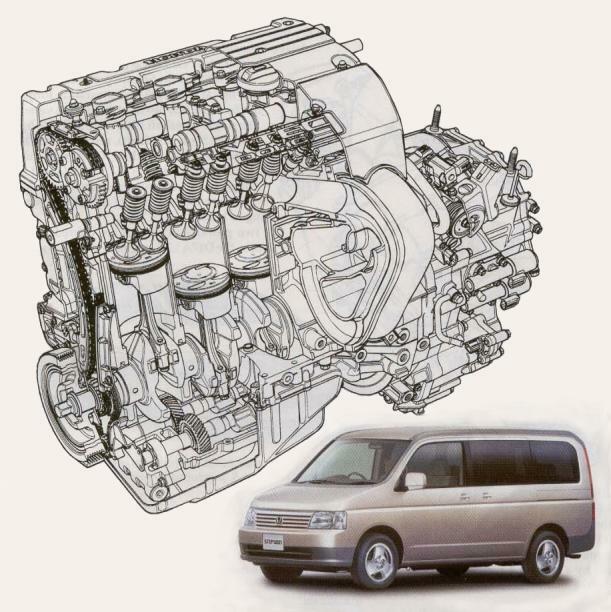 To achieve this objective, the new Nobuhiko Kawamoto (former president of Honda) designed water-cooled inline two-cylinder engine of 360-cm3 displacement was placed in line with the transmission, with the latter on the driver's (right) side. The engine thus revolved counterclockwise. The Life was the forerunner to the 1972 Civic powered by an inline four that was essentially the Life design with two more cylinders. Honda's K20A as installed in the Japanese-market Step WGN is fitted with two contra-rotating balance shafts in the lubricant sump. The latest i-series engines have a forward-facing intake and rearward-exhaling exhaust system when installed transversely. The K-series is the successor to the current 2.0- to 2.3-L F-series that powers various midsize vehicles including current Accords. However, its first mission was to replace the unique type-B20B engine in new Civic-platform-based vehicles including the second-generation CR-V. The B20B was an innovative product of necessity, being derived from the B-series I4 that had originally been designed as a 1.5-L unit, then expanded to 1.8 L for vehicles based on the previous-generation Civic platform. For the planned first-generation CR-V, the B18 was found to be lacking sufficient torque. The most expeditious course of action was to increase displacement, which was obtained by the clever "Siamese quadruple" iron liner design in the original-size aluminum block, earning the designation B20B signifying 2.0 L.
The new K-series was designed to fit in the engine bays of both the compact (Civic, et al) and forthcoming midsize (Accord and company) platforms. It is 54 mm (2.1 in) shorter in length and 10 kg (22 lb) lighter in mass than the F20B engine. A length reduction was achieved by the use of a single-stage, small-pitch6.35 mm (0.25 in)silent chain driving twin overhead camshafts in place of the single-camshaft F-series' cogged belt drive, serpentine accessory drive, and other measures. The die-cast aluminum cylinder block now has four conventional separate iron liners cast in. The K-series is available in several mechanical, electronic, and chemical (catalyst) permutations. As installed in the compact Stream, a station wagon/minivan crossover vehicle, the K20A runs on leaner mixtures (about 23:1 air/fuel ratio) when lightly loaded and in steady cruising. The Stream, a five-door vehicle with conventional hinged doors on a stretched Civic platform, accommodates up to seven people in three-row seating. It is 4550 mm (179 in) long on a 2720-mm (107-in) wheelbase, 1695 mm (67 in) wide, and 1590 mm (63 in) tall. The vehicle's K20A engine displaces 1998 cm3 with square 86-mm (3.39-in) bore and stroke, versus the F20B's 1997 cm3 with 85-mm (3.35-in) bore and 88-mm (3.46-in) stroke. The U.S. CR-V model is powered by a larger 2.4-L verstion of the K-series, which will also be the mainstream engine for the next-generation Accord. The engine's dual overhead camshafts act on four valves per cylinder via rockers with roller-cam contacts. The intake side is fitted with Honda's VTEC (variable timing-electronic control) mechanism, which combined with VTC continuously variable phasing control, is now called "i-VTEC." As before, during low-load, steady-state operation, one of the inlet valves is nearly deactivatedkept to 1.0-mm (0.04-in) lift; together with the shape of the secondary (nearly deactivated valve side) port, this generates a powerful swirl motion in the combustion chamber to fast- and lean-burn mixtures. The VTC optimizes valve overlap, reducing pumping loss within the cylinder and raising the lean-burn limit. The lean-burn K20A's piston crown has a shallow bowl positioned off the center toward the exhaust valves. The high-performance K20A without balancer shafts) powers the Civic type-R, produced by Honda's Swindon, England, factory. The i-VTEC enables internal exhaust gas recirculation (EGR) to improve fuel economy during stoichiometric operation such as high-load, high-speed driving by altering valve overlap. The induction system features a variable-length plastic manifold whose length is altered by a rotary valve, reducing flow resistance. The exhaust system combines three-way and NOx-cleansing three-way catalytic converters. The die-cast lower cylinder block carries five main bearings. A cassette-type twim contra-rotating balance-shaft system is inserted under the lower block to offset the inline four-cylinder engine's inherent second-order vibrations. The front shaft, driven by a silent chain from the crankshaft, drives the rear shaft via helical gears. The K20A in the Stream produces 113 kW (154 hp) at 6500 rpm and maximum torque of 186 Nm (137 lbft) at 4000 rpm, versus the single-camshaft F20B's 110 kW (148 hp) and 186 Nm (137 lbft), respectively. The vehicle's Japanese urban 10/15-mode fuel consumption rating is 14.2 km/L (about 34 mpg)a 15% improvement over a comparable vehicle powered by the F20B, according to Honda. Two powertrain choices are offered in the Stream: the D17A 1.7-L engine with a four-speed automatic and the new K20A 2.0-L with a new five-speed automatic. The D17A is still a counterclockwise-revolving engine mated to the familiar Honda automatic on the right side of the engine, whereas the new clockwise-revolving i-series required new transmission designs. The new type-MRPA five-speed automatic follows Honda's tradition of compact, three-shaft, constant-mesh geartrains. The transmission is electronically controlled and has a manual shift facility with the "(plus over minus sign here)" gate alongside the main quadrant. The second vehicle powered by the K20A is the Japanese-market-only Step WGN, a vehicle for families and young people with friends to transport. The 4670 mm (184 in) long, 1695 mm (67 in) wide, and 1845 (73 in) tall box on wheels carries up to eight people. It shares its platform with the second-generation CR-V compact SUV. The K20A 2.0-L engine for this application operates in a stoichiometric environment to obtain an ample and even spread of torque to move the bulkier, heavier vehicleand more importantly to allow the use of the new perovskites three-way catalytic converter. The engine is rated at 118 kW (160 hp) at 6500 rpm and 191 Nm (141 lbft) at 4000 rpm on the same 9.8:1 compression ratio. By far the most significant technology in the Step WGN application of the K power unit (although announced with somewhat subdued publicity efforts) is the catalyst using perovskites and other metal oxides. Jointly developed with Catalytic Solutions, Inc. (CSI) of Oxnard, CA, the three-way catalytic converter allows "a 50 to 70% reduction in the use of precious metals such as platinum, palladium, and rhodium," according to Honda. CSI developed the new catalytic coating materials used in the catalyst. Honda now holds 10% of CSI stock. More than one Honda insider hinted that the reduction could be far greater than the numbers quoted. The same sources said that the perovskites catalyst had been a known technology researched and experimented by leading institutes, but none attained product application. 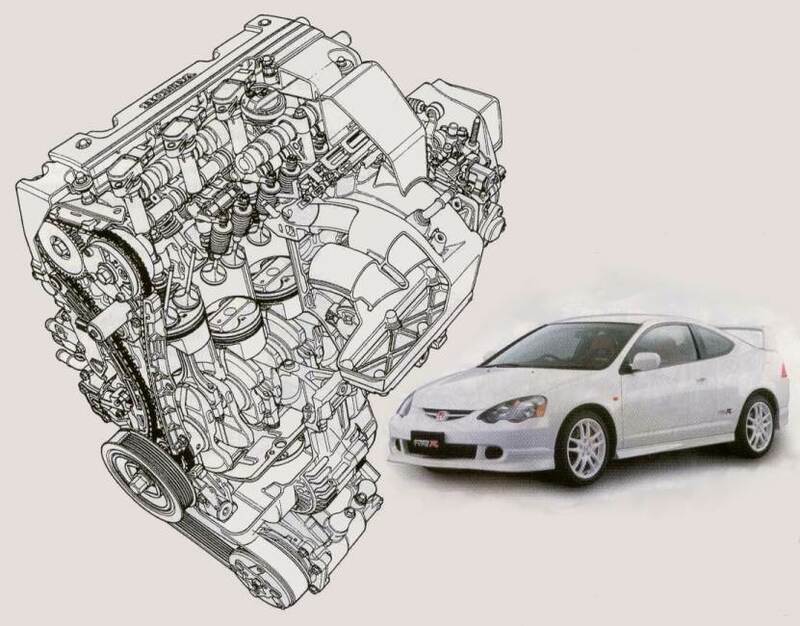 Honda's advanced engine-control technologies, in particular in mixture preparations and combustion, enabled the company to adopt this breakthrough system. The third vehicle to be powered by the K20A (in 2.4-L form) is the second-generation CR-V. The engine operates in stoichiometric tune calibrated for the compact SUV application. It retains the balancer cassette in the crankcase (the cassette was removed in the Step WGN application), and is rated at 116 kW (155 hp) and 190 Nm (140 lbft) on the same compression ratio and at the same rpm. Still designated K20A and staying within the 2.0-L displacement, the unit that propels the Integra type-R coupe and Civic type-R hatchback is a different animal, putting out 162 kW (220 hp) at 8000 rpm, with 500 more rpm on tap, and 206 Nm (152 lbft) torque at a high 7000 rpm on a high 11.5:1. The i-VTEC/VTC system employs a different strategy to extract maximum engine power and torque. The exhaust camshaft is also fitted with VTEC. The rotating and reciprocating components are strengthened. The type-R inhales through a fixed and equal length four-tract manifold, and exhales through equal length individual stainless tubes, which collect into two pipes, thence to the single underfloor catalytic converter. The type-R is offered only with the new manual six-speed transmission, which is 20 mm (0.8 in) shorter than the previous version and 2.5 kg (5.5 lb) lighter at 53.2 kg (117 lb). The Integra is also available with the 119-kW (160-hp) K20A, sans exhaust VTEC, mated to a new five-speed automatic or a five-speed manual. No balancer cassette is fitted to either version, as high rpm is its business. Honda's new L13A I4 powers the Fit using two valves per cylinder and two variable firing/timing plugs for maximum fuel economy. The second "i" inline four is the L-type family, called "i-DSI," the suffix letters standing for Dual and Sequential Ignition. The L-type covers the 1.0- to 1.5-L displacement segment, primarily to power new vehicles on the Global Small Platform because the L13A engine is also the IC propulsion portion of the larger Civic Hybrid sedan. The first vehicle propelled by the i-DSI engine is the Fit five-door, which recently won the Japanese Car of the Year 2001/2002. The single-body Fit outsold the multi-pronged Toyota Corolla in November 2001 to top the Japanese sales chart. The Fit will be a truly global car; it will be produced in Thailand and later in the UK and Brazil. It will be called the Jazz in Europe. The Fit is a fivedoor hatchback measuring 3830 mm (151 in) long, 1675 mm (66 in) wide, and 1520 mm (60 in) tall, on a 2450-mm (97-in) wheelbase, and offered in front- and all-wheel-drive configurations. Its moderately tall height enables the car to fit in the typical mechanized pallet-type parking device (usually with a 1.5-m height limit) seen in major Japanese cities. Yet the car's floor is low enough to provide ample space for four people and 328-L (11.6-ft3) luggage volume, made possible by placing the 42-L (11-gal) plastic fuel tank under the floor directly under the front seats. This frees up space in the rear of the vehicle, as well as creates generous foot space for rear passengers. The tank is well protected, boxed in by side frames and crossmembers. The underfloor structure is more like a perimeter frame integrated in a unitary body shell. According to Honda, nearly 90% of frontal crash energy is absorbed by the frame structure. The Fit body is said to be more than twice as stiff in bending and 16% stiffer in torsion in static measurement than the predecessor Logo hatchback. This stiffness and larger body were not free, however; there is an increase in mass from 980 to 1080 kg (2160 to 2380 lb), depending on drivetrain and equipment. Suspension is by MacPherson struts up front, combined with electrically assisted rack-and-pinion steering, and a twist beam on separate coils and shock absorbers at the rear. The brake system comprises front ventilated discs, rear leading/trailing-shoe drums, ABS, EBD (electronic brake distribution), and brake assist. The ABS employs a new active sensoran MR-element semiconductor picking up signals from the magnetic encoder on the wheel-bearing sealthat extends ABS capability to nearly a full stop, versus 8 km/h (5 mph) for typical ABS. Honda's previous small-car engine, the type-D, was a relatively simple unit: a single-overhead-camshaft, two-valves-per-cylinder unit with no variable valve timing/phase function. The new type-L continues with the SOHC, two-valves-per-cylinder tradition; however, it is a new design incorporating a significant variable feature, i-DSI, employing two spark plugs per cylinder firing simultaneously or sequentially, depending on operating load and engine speed. The L13A that powers the Fit and Civic Hybrid has a 73-mm (2.87-in) bore and 80-mm (3.15-in) stroke, for a total displacement of 1329 cm3, versus the type D's nearly square 75 x 76 mm (2.95 x 2.99 in) dimensions and 1343-cm3 capacity. The type-L engine's bore pitch of 80 mm (3.15 in) is shared with the Insight Hybrid's three-cylinder engine. The two valves per cylinder are placed diagonally in the compact combustion chamber at an included angle between the valves of 30 versus 40° compared with the type-D engine. Valve diameters are 32 mm (1.26 in) for intake and 28 mm (1.10 in) for exhause2 mm (0.08 in) larger than the type-D. The piston crown has a shallow bowl. One spark plug is placed adjacent to the intake valve, which is toward the front of the vehicle, thus designated the intake-side or front spark plug; the other is the exhaust-side or rear spark plug. The engine has its intake manifold facing forward and exhaust exhaling rearward. Each spark plug is energized by its own coil; all together, eight coils are used in this engine, directly mounted atop the plugs. The i-DSI is a fast-burn engine, largely operating in a stoichiometric environment. The i-DSI strategy continuously varies the twin plug's firing sequence and timing, depending on load and engine speed to effect a fast mixture burn. The engine has a high compression ratio of 10.8:1, yet is quite content with regular-grade unleaded gasoline. A large dose of EGR may be introduced due to the fast burn by twin spark plugs, reducing pumping loss, thereby improving fuel economy. As the Honda tradition, the cylinder block is die-bast aluminum with cast-in, Siamese, thin-wall2.5 mm (0.01 in)iron liners. An aluminum ladder-type holder supports five lower bearings within the sturdy, die-cast, deep aluminum sump that adds to the power unit's stiffness. A high-rigidity forged crankshaft is supported by five main bearings whose journal diameter is 50 mm (1.97 in), 5 mm (0.20 in) larger than the 1.5-/1.7-L D-family unit's. Friction reduction is another important design consideration of the engine. Small MoS2 particles are shot-peened and impregnated on the piston skirt surgace, the first such application in the world, according to Honda, which reduces friction by 3.2% versus the more widely used molybdenum coating. The overhead camshaft is driven by single-stage, small-pitch, 6.35-mm (0.25-in) silent chain, and acts on two halves via low friction roller-follower rockers. During cold operation, coolant is circulated only to the cylinder head, thus accelerating block and lubricant warmup, contributing to the reduction in friction. During higher-temperature-operation, coolant is circulated from the head down to the block. The dual-mode cooling system improved warmup by 4.2° within 100 s after starting up, translating to a 3% reduction in friction during cold operation. As in the valvetrain, there is no "vee" in the induction, which uses a plastic manifold with four equal-length 400-mm (15.7-in) tracts. A six-hole, lightweight, and short fuel injector is employed in the L-type. The L13A 1.3-L engine as installed in the Fit produces 63 kW (86 hp) at 5700 rpm and 119 Nm (88 lbft) at 2800 rpm. It is 69 mm (2.7 in) shorter (crankshaftwise) and 118 mm (4.6 in) narrower than the preceding 1.3-L D-series unit. It is combined with Honda's steel-belt/pulley CVT with multi-plate starting clutch. Honda is adding steel belt production capacity of its own to that procured from the Dutch VDT (Van Doorne Transmissie) to meet the increasing demand for this transmission. The front-wheel-drive Fit is rated at 23-km/L (about 54-mpg) fuel consumption on the Japanese urban 10/15-mode test cycle. Honda is proliferating the global small-car platform family with the Mobilio mini-minivan, which seats up to seven people in a versatile three-row configuration. Its tall, boxy, and airy body is built on a stretched 2740-mm (108-in) wheelbase. The five-door wagon is all of 4055 mm (160 in) long and 1685 mm (66 in) wide, but is quite tall at 1705-1760 mm (67-69 in) for front- and AWD applications, respectively. It has gained some 200 kg (440 lb) over the Fit, requiring a larger displacement L15A engine with more low- to mid-speed torque. The L15A obtains its total displacement of 1496 cm3 with a longer 89.4-mm (3.52-in) stroke to the same 73.0-mm (2.87-in) bore as the L13A. The engine shares the same i-DSI twin-plug, stoichiometric, fast-burn strategy. It is rated at 66 kW (90 hp) at 5500 rpm and 131 Nm (97 lbft) at 2700 rpm on the same 10.8:1 compression ratio, and is mated to the CVT. As with the Fit, the platform places the fuel tank under the front seat, creating a flat floor. The third-row seat is surprisingly comfortable, a 176-cm (5-ft, 9-in) editor fitting there without hugging his knees. Honda obtains an outstanding 29.5 km/L (about 70 mpg) on the Japanese 10/15-mode urban cycle, as well as winning the contry's U-LEV certification, with the Civic Hybrid sedan, whose IC powerplant is the specially prepared type L13A engine. In the hybrid application, the i-DSI engine gains VTEC. The VTC, in this case, deactivates three of the four cylinders on deceleration, greatly reducing the engine's "resistance," thereby assisting IMA's (Integrated Motor Assist) regenerative ability to store electronic energy in the battery, which is a compact nickel/MH pack placed behind the rear seat, leaving a 342-L (12-ft3) luggage volume in the Civic sedan body. The L13A in the hybrid produces 63 kW (86 hp) at 5700 rpm and 119 Nm (88 lbft) at 3300 rpm. The electric motor is a dc brushless unit rated at 10 kW at 4000 rpm and 49 Nm (36 lbft) at 1000 rpm. Combined, the IMA power unit produces 69 kW (94 hp) at 5700 rpm and 119 Nm (88 lbft) at 3300 rpm. Torque comes in strong from as low as 1000 rpm, its curve very flat up to peak rpm, therefore endowing the 1190-kg (2625-lb) car with brio, especially in the low- and mid-speed urban range. The drivetrain includes the CVT. The Civic Hybrid is equipped with an electrically assisted power steering, another economy-enhancing measure.